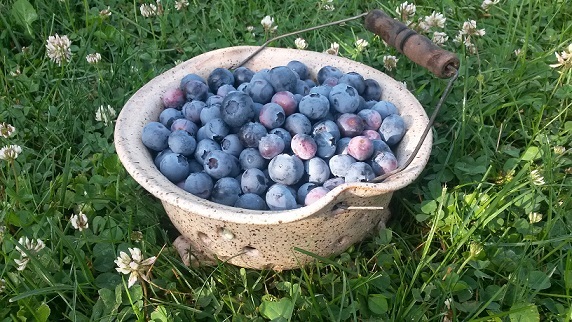 Picking blueberries in my back garden in the coolness of the morning is both a meditation & a prayer of gratitude for me. I planted the 8 bushes that line one side of my yard, nurturing them over the years so they can produce flavorful berries that nourish me, my loved ones, & the local wildlife (which I also consider my loved ones). The act of gardening is a spiritual experience, connecting me to all that is. It also allows me to quickly disconnect my overactive mind & fall into a gentle easiness that a familiar task can bring. There is no need to analyze or worry for I know from a lifetime of experience that all I must do is pluck the plump berries that fall easily from the branch. If I have to tug at the berry to get it to fall into my pail, it’s not ready& all I gain from forcing the situation is a hard, sour berry that is unpleasant to eat. I’m finding life works in exactly the same way… if I have to force it, whatever “it” is, it’s most likely not going to work out the way I’d like it to. Yes, I must show up & invest wholeheartedly in the moment, but it’s equally important that I willingly surrender to the natural flow of things. We’ve all been there & we all know the difference between when something feels right & when something feels forced. I have also learned that if I look at the bush from one perspective, I may think I’ve seen all there is to see, missing out on the bounty that may be tucked under some leaves or hidden around the back of the bush. Shifting my perspective allows me to see a treasure that wasn’t visible from my own narrow viewpoint. I can carry this lesson into my daily life & relationships… acknowledging that my point of view is just that– one point of view– and that there are other perspectives I can consider, opening my soul to understanding, compassion, & empathy. There is wisdom in books, gurus, & retreat centers but there is a simple yet profound wisdom gained by being still, being present, & being authentic. This I can do in my own back garden, among the blueberry bushes. This entry was posted in A Window on Life, It's All Connected: Spiritual Musings, My Love for Nature and tagged earth, garden, gratitude, inspiration, life, nature, philosophy, prayer, self-awareness, spirituality, wisdom by puresusan. Bookmark the permalink. Thanks so much for this beautiful and wise meditation on blueberries and the present, rich, delicious moment with our wild souls.